So you’re just about to buy some wonderful fashion and you wonder ‘Does Topman do a student discount?’. Well we are excited to confirm that there is a 10% Topman student discount. To get it, go to this page on topman.com and follow the instructions and you’ll be issued with a 10% promo code. For full ts and cs check out chapter 1 of this guide. Is there a Topman UNiDAYS, NUS or Student Beans Discount? Widely regarded as THE fashion destination for men on the high street, Topman is the younger brother of womenswear fashion chain Topshop. The first menswear-focused fashion chain to break into the UK market, Topman today can be found around the world and is a dominant force in men’s couture; keeping it accessible, affordable and adaptable. There is a Topman student discount code to get 10% off all full priced items and great news as sales items are included too. This is quite rare when compared to similar stores and is a nice addition. In-store you just have to present any valid student id. Also there is a useful button to turn on to see the student prices (you might have to go onto the student page). We get asked a lot of questions by students about the Topman student discount so we’ve put together this ‘Frequently Asked Questions’ section in order to answer them fully! Does Topman do a student discount? We can confirm that there is a Topman student discount. The standard reduction is 10%, although they have limited periods throughout the year when this is raised to 15 and even 20% and is valid both online at topman.com and in-store. Is there a Topman Unidays discount? Yes, there is a Unidays code for Topman. To get it you must be registered at myunidays.com and you will be able to generate it there. You then add the code to the online check-out. Can students get a discount in-store at Topman? Students can get a student discount when in a Topman store. To get it you need to show a valid student id. This includes NUS card or NUS Totum. If you’re not sure just show what id you have and ask the assistant. Does the Topman student discount work on sales items? Yes it does. Just enter your code as described as above and the reduction will be made. There are some limited items not included so they won’t be discounted. Did you know that there are extra ways to save? Read our next section for some great ways that students can save at this premium menswear store. Even though there is a Topman student discount, we’ve found that there are more ways to save as we’ve been researching this guide. So this next section shows you how. There is a permanent sales page on topman.com which lists all the latest clothing that has been reduced. Also don’t forget that you can use your 10% Topman student discount on top of sale prices. Throughout the year we have seen that Topman release some voucher codes that anybody can use. These have included free delivery, 20% off everything and more reductions too. We’ve written a whole chapter on promo codes so make sure you read it and check out our savings section where we will list any current ones. Just to make things super easy, we’ve listed the latest offers, deals and promo codes at the top of our page in the savings section. This is regularly updated with some of the best offers, sales and deals that Topman offer. It’s helpful, easy to follow and could save you some money so make sure you check it out now! Did you know that if you sign up to the newsletter on Topman.com then you get a promo code to get 10% off. Off course you get the latest new lines, fashion tips and exclusive offers too so it’s well worth it. Did you know that there is a Topman deals and offers page. It’s not available from the home page so it’s a little hidden away buy you can find it here. The Student Squirrel is good at sniffing out these types of pages! They list multibuy deals such as 2 tees for £12 and 3 for £7 on socks. There is nothing more frustrating than finding some bargains, getting to the online checkout and then finding there is a big charge for delivery. If you get it delivered to a store then it is free for orders under £50. Plus all return are free which is a nice touch and there are options for express and Parcel Shop delivery too. We’ve written a bespoke chapter on this but throughout the year these sales happen like clock work and have the biggest discounts. 3. Is there a Topman UNiDAYS, NUS or Student Beans Discount? There are now quite a few different student discount schemes in the UK and it can be difficult when you’re looking for a specific store to get a reduction, like Topman for instance. The 3 biggest ones are NUS, UNiDAYS and Student Beans. We get asked a lot whether there is a Topman student discount through these schemes so we’ve done some extensive researching so we can answer your questions properly! It’s great news to start off with. There is a Unidays Topman promo code available to get you 10% off your purchase online. To get it you need go to this page on topman.com, follow the instructions and get verified with UNiDAYS. You’ll be issued with a bespoke student voucher code to enter at the checkout and bob’s your uncle you’ll get a terrific reduction on ALL full priced items. The actual answer to this is yes and no! Confused? Don’t be. We’ll explain. You can get a Topman NUS discount in-store as your card will be valid student id. However online there is no NUS promo code available. But remember there is a Unidays discount which you can still get, just read above! 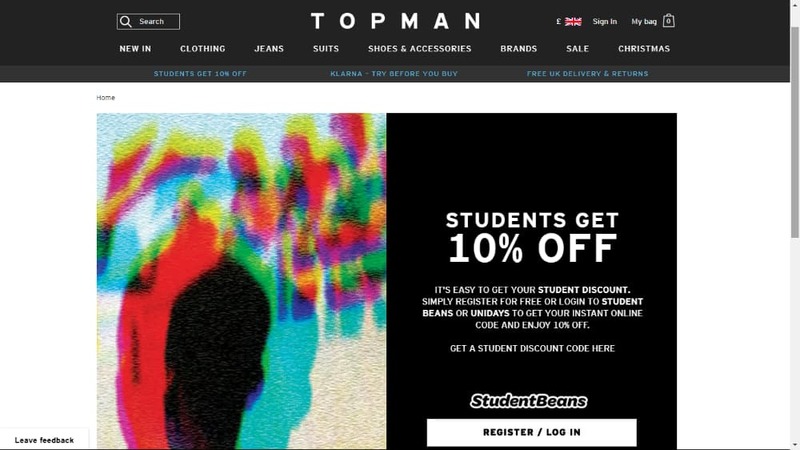 We’re delighted to inform you that there is a Student Bean Topman discount online. It works the same way as the Unidays discount so just head to the special page below, follow the instructions and you’ll get a nice reduction. The savings don’t stop there though students. Read on to get some more excellent savings tips! 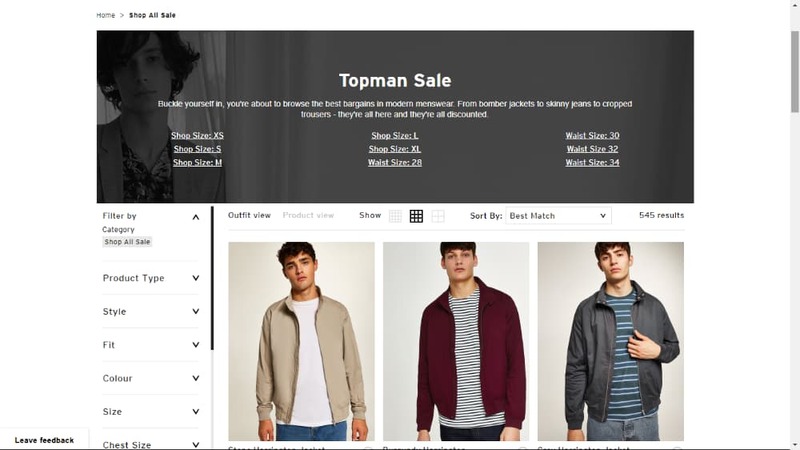 A great way to save online in the UK in the 21st century is with a Topman promo code. Unlike the Unidays and Student Beans instant codes, these are available to everyone. So what’s the point for students when you can already get these? We’ll the Student Squirrel keeps a watchful eye on voucher codes throughout the year and he’s noticed that sometimes there are bigger discounts than the standard 10% code. This has included a 20% code around Christmas time! Plus you don’t have to go through the rigmoral of logging into Unidays. The squirrel also lists all the current codes in our fantastic savings section so make sure you take a look. Using the codes are easy, just do your shop on topman.com, get to the check-out and enter the code and the relevant reduction or offer will automatically be applied. We’ve already mentioned that the biggest reductions at topman.com come when there is one of the big sales are on. The Squirrel tells us that he’s seen reductions of up to 70% at these times. Wow! And it’s rare but don’t forget that you can stack your Topman student discount on sale items and get a bigger reduction. There is even a helpful button to switch on the website to show you student prices. The biggest sales happen around the same time each year. Check the dates below as if one if coming up it might be best to hold on a little big longer. Black Friday and Cyber Monday is a big time for this top mens fashion store. We’ve seen a great 50% off lots of lines including clothing, shoes and accessories. Keep your eyes peeled and you could bag a right good bargain. On the run up to Christmas Topman actually run some pretty good deals. We’ve seen flash sales and 20% promo codes released. Then when the delivery dates expire (around 22nd December) the big discounts start with 50% and then a few days later 70% is possible! We recommend that if there is something you want then get it as soon as it’s in the sale as it might sell out. Around mid March there is a good chance of a mid-season sale and also something for Easter too. We’ve found that they have a good 50% sale on selected items, and then add additional discounts of 20% on sale items so you can get up to 70% off. This is one of THE best times for students to bag a bargain. The UK fashion stores love a good sale on a bank holiday and the ones in May are no exception. Fancy 50% off? This is a typical Topman saving around this time. They also include seasonal mens clothing such as shirts, shorts, sunglasses and shoes so it’s a great time to refresh your wardrobe for the coming spring and summer season! If you haven’t heard of NICCE, where have you been? A premium streetwear brand, NICCE takes an urban approach to informal attire with a smart enough twist that you’ll keep looking designer rather than drab. This roomy barrel bag has only subtle branding and is big enough to fit in all your essentials for the gym, sports club, or to act as an overnight bag. An extra shoulder strap allows easy carry cross-body or shoulder, and an exterior zip compartment makes for a handy phone, wallet or tickets slot. A barrel bag is a wardrobe staple and combines fashion and function for lots of uses! As the weather heats up and fashion goes a little less formal, sportswear and leisurewear combine to make sports-luxe the favoured trend for the season. These joggers are less gym, more high street, and give a luxury twist to what would normally be a scruffy garment. Slim fit with a slightly cropped leg to show off those kicks, these joggers are made of polyester and elastane (giving you the comfort fit you’d expect with normal trackies) with a single stripe detailing in satin down the side. These are totally machine washable and have pockets in for your essentials. Hungover? Tired? Desperately trying to avoid someone around campus? Chucking on a hand can save you from a world of sin and can be chucked on quickly on your way out the door to hide your blushes. Family-run Canadian accessory brand Herschel is currently really popular, particularly for their bags and rucksacks, and so with this branding you’ll be bang on trend, even when you’re not really trying. The structured and ventilated cap won’t overheat you and being made of 100% cotton, it’s easy washed if and when required. Most Topman stores are found sharing premises with Topshop, but there are standalone stores in smaller towns and cities where space is at a premium. The chain’s flagship shop is on London’s Oxford Street, alongside Topshop’s, and offers a whole host of exclusive collections and collaborations as well as being a premier location for scouts from famous modelling agencies to find talent. If there isn’t a Topman store or concession in your area, fear not; the whole range is now stocked online at Topman.com and is available for delivery to several countries. Any item of clothing you need, they will have it in stock. Everything from underwear, t-shirts, shoes, suits, gym gear and denim collections can be found in store, under both their own brand and a range of others; including Calvin Klein, Converse, Criminal Damage and Levi’s. No matter the name on the label, though, you can be sure: everything will be carefully curated and expertly crafted, to a higher standard than you’d normally find on the high street. From time to time, there are fantastic design collaborative collections with labels and designers in limited runs; and these are usually extremely sought after once released. Successful collabs have included limited-edition ranges as well as collections launched at London Fashion Week, with the likes of Kim Jones, Paul Gorman and Antony Price. If you manage to get your hands on one of these pieces, keep hold of it – it could be worth a lot more than the RRP in the future! Topman isn’t a budget brand, which may seem like an unusual recommendation for Student Discount Squirrel. However, we recognise quality and longevity when we see it, and budget brands just don’t fit all occasions! All is not lost, however, we can still help you save money: there’s a standard 10% student discount across all full-price items in-store and online, as well as regular sales and discount events – and the occasional promotional discount code to be found on the internet! Keep an eye on Student Discount Squirrel for the latest in frugal fashion. There’s no doubt about it; if you want to add a touch of trend to your attire without looking like you’ve tried too hard (or actually without trying too hard at all), Topman is the shop for you. Their collections aren’t haute couture but they look great and you can rest assured that everything is ‘current’… even if you’re not up-to-date on the latest yourself! It’s flagship London store has it’s own brand called “Lens”! Something more sporty – well we love Nike, so always worth checking out of there’s any Nike offers or even an old favourite with student JD Sports! Something smarter and on a budget – good old Burtons? Jack Wills is very popular with students as is Jacamo! And a new fav of our for top gay fashions is Sissythatstyle! Certainly a brand to watch!